Dr. Toni Brayer has a guest post at ACPInternist about how insurance companies are killing primary care. I would like every Grand Rounds Reader totake a look at thisand think very hard about what they will support in terms of insurance industry oversight. This post was first published on Dr. Brayer’s blog EverythingHealth.net. Bongi is a surgeon working in South Africa – he shares part of his day. Mental Notes blogs on the importance of doctors and dentists paying particular attention to giving their best to developmentally delayed patients. How To Cope With Pain has a post that is one of a continuing series about why chronic pain patients should seek help from a support group. Behaviorism and Mental Health has the second part of an article on the origins of the condition called frotteurism. Shrink Rap has a very poignant post about drug reps in the waiting room. In Sickness and In Health has thoughts on how couples who are both ill can cope. The insurance industry viewpoint on how Obamacare is going to wreck the country is covered by InsureBlog in a refutation of commentator Ezra Klein’s piece on the effectiveness of Romneycare in Massachusetts. Colorado Health Insurance Insider has the most practical advice post this week by explaining what to do if a rock gets caught in your nose – we kid you (s)not!! Dr. Val at Get Better Health shares a recent video clip on how to stave off memory loss. Our old friend Happy Hospitalist has a tres amusing post about the fall down of water charities – trust us, just read it. Health Business Blog has an interesting post about the burgeoning trend of hospitals giving (selling?) marketing companies access to patient specific electronic health records to better tailor individualized ads that will be directly sent to the patient.Will the marketing outfit know you have cancer before your doctor does? ACPInternist has a post on debating the ethics of doctor-assisted suicide. Healthcare Technology News provides a compendium of resources and analyses related to the meaningful use of electronic health records. American medicine is becoming increasingly corporate and now some physicians are actually filling positions with the title “Chief Experience Officer.” Hard to know, really, what that might be, but take a look at the post to find out at ACPHospitalist. Dr. Pullen says he is off his normal subject matter with a post on prescription-abusing NFL quarterback busts, but oh, yeah, baby… training camp is here!! And, going from pill-popping jocks to the more sensitive type, Dr. Charles sends us a poem about the end of life in a hospital bed. Attention, attention, attention Grand Rounds Readers, please check out this post if you like to write poetry as Dr. C. has details about a poetry contest he is sponsoring where the prizes are a cherry tomato and (gasp for a poetry contest!!) real cash – yep, 500 bucks to the winner. In the terrifically named blog Glass Hospital, there is an argument that the current concept of the Patient-Centered Medical Home won’t work. Many kudos to Dr. Nick Genes for originating the Grand Rounds series. Next week’s Grand Rounds will be at Life in the Fast Lane. Great job, Doc! Thanks so much for hosting, and for including our post. Great selections, thanks for pointing the way! 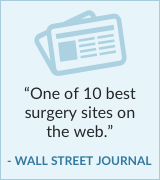 InsideSurgery hosts this week’s eclectic collection of great medblog posts….